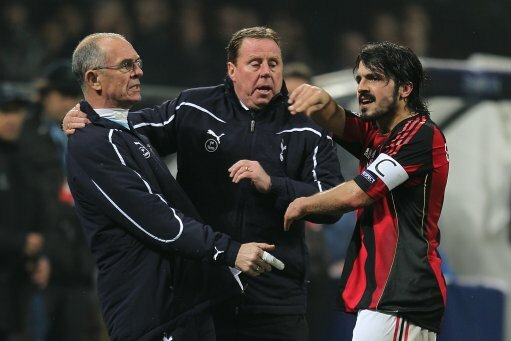 As you may be aware, UEFA handed Gennaro Gattuso a four-match ban for his little tete-a-tete with Tottenham assistant Joe Jordan last week which, in addition to the original one-match suspension he incurred by picking up a booking earlier in the evening , means that the Milan scrapper will now be unavailable for the next five of the Italian club’s upcoming fixtures. “Young Alexandre Pato ran to the locker room – he was probably hiding in the bathroom! – and it’s lucky Antonio Cassano was ineligible for the Champions League. Yep, you read that correctly, Gattuso has indeed been charged with keeping Antonio Cassano’s conduct in check. Like setting a flaming gazelle loose inside a dynamite factory.